We came across these beautiful Wattled Cranes on safari in the Okavango Delta region of Botswana. With a Conservation Status listing as “Vulnerable,” we were delighted to find a trio wading in a shallow pond. 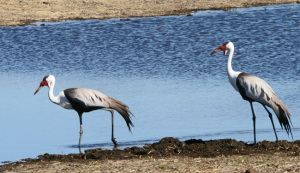 The largest crane in Africa (and second tallest in the world to the Sarus Crane), Bugeranus carunculatus can be found in sub-Saharan Africa. They are named for the wattles, or fleshy appendages, that hang down from the throat. A five foot tall bird with a wingspan of eight feet, they have a commanding presence. Wattled cranes prefer to eat aquatic tubers and rhizomes, as well as aquatic insects, snails and amphibians; and are consequently found in marsh-like settings. 90% of foraging is done in shallow waters where they dig vigorously with their long bill.